All Motor All Motor Advanced Performance. Talk about Engine Swaps, Internal Engine work. Not your basic Y pipe and Intake Information. No where near 280 unfortunately. Assuming you're going to use 3.0 timing, get an 07+ Altima 3.5 or a 09+ maxima 3.5 to start and you'll be closer. Maybe at the crank if he's lucky, but certainly not at the wheels. if i 3.5 swapped i would just get a 04 05 seeing that there are so many mixed feelings about power with the hr style motor on 3.0 timing, no vtc? That engine will give you 260HP at the crank, even less at the wheels. Last edited by 98max98; 10-31-2017 at 08:42 AM. obviously nothing works how you want it without support. I'm not sure what mixed feelings you're talking about. If you're going to do all that work and use an older generation 3.5, that's two steps forward and one step back. ok makes sense. so ive been reading threads trying to gain some understanding about whats possible with the vq. i already have general knowledge and know my way around a motor.according to some of the threads ive read. its possible to swap the 07 hr style heads onto the old 3.5 block. what if i took the alti head all the way up to the manifold and swapped that over to put into the 4th gen. im still a little confused on the cam redrilling and dowel pin stuff but essentially it should work. i know its probably overkill but apparently the alti head flows better than a ported old de head and cheaper. will i be able to do this an not run into any snags with compatibility in reference to bolting things on. or is it not worth it. Last edited by 98max98; 11-01-2017 at 12:44 AM. Yes the HR heads fit the older DE block. Just start with an 07+ Alti or 09+ Max 3.5. You'll avoid older gen oil burning issues and you won't have to take the heads off. Unless you do a full 3.5 swap you're not going to see those numbers man. 3.5 swaps are overrated. FI is where it's at. You'll never see the area under the curve of a full swap but with the right static cam timing you have the ability to hit close to full swap peak numbers. He can see around 280whp with a +09 max 3.5 swap+bolt ons and tune. otherwise i do not see it happening. coming from this azzhole hoarding all the S/C kits. But I have yet to see a proper 3.0timing HR build with supporting mods and proper tuning. In the past three years of the 3.0 hr builds there's been 0 progress, nobody still seems to know what the optimal HR manifold VIAS switchover RPM, or is it better to gut the manifold = simple engine efficiency steps needed to determine power delivery and peak power. Last edited by vipervadim; 11-03-2017 at 09:41 AM. I really think that the few FWD HR 3.0 timing swaps before me didn't realize the intake cam dowel was off from the 3.0 timing and went for it. It looks close as illustrated in my swap thread but off enough to have an adverse effect on performance. I really wanted to crack 12s with my car but it's done. It's burning oil at the valve seals. (I've never seen this talked about elsewhere so I'll assume it's an isolated case) The car overall is beat (it was in 2 accidents and stolen before I even got it) and I've done the swap more or less 3 times with 2 engines. Not interested in a 4th time. I piggy backed some assumptions off of SurraTT's 09 swap. He showed that gutting the 09 manifold lost power on a full swap so that was proof enough to keep mine functional. I also believe I got my guestimates for VIAS switchover off of his full swap RPM settings. Yeah they might be different but by how much? Quantitatively I was able to trap 106 and get 30 mpg highway. 13.3 with a 2.0 60' as the lowest I got it. Without a shtty 60 it's 12s easy. For an i30, that's pretty decent. Also FWIW I was trapping 102 max with the old 3.5 DE and a 2.5" exhaust. 106 with the FWD HR and a cutout. At the end of the day I don't think there's that much to figure out about the FWD HR. Full swap or not, it flows more and will make more power than it's DE counterpart mod for mod. There is no really power to be made messing with the VIAS, Nissan actually did a pretty good job this time round just run vac lines to it and leave it alone. Here is the reason i said that, most people will NOT tune their cars. Secondly even though the heads flow more in all honesty i do not see that making a big enough difference to bump up power with out the compression changing. Which it does in the +09 max motor, not in the +07 alti. And it is because the DE heads flow well. The real benefit outside of the headflow is the stronger bottom end the HR motors provide. But 3.0 timing a cammed DE with HR pistons will out perform a typical 3.0 timed HR swapped cars, and for that matter a 5.5gen with a cams and HR pistons will most likely out perform HR swapped cars. I'll put money down on that. (Darren just threw a cammed DE on the dyno made 300whp w/ stock compression). Now the good thing is the 3.0 timing can run DE cams so all the cam options are still available. so optimally which is what i did was use my 350Z rev-up cams in my 3.0 timed +07 alti motor. (My car is on boost so we cant really compare what will happen when etc happens). For him optimally if he wants to make those numbers he will need a +09 max motor, then add a decent set of cams to it. Atleast Rev-up, if not some JWT S1 or something variant. The 3.0 is all but dead for tuning. The only good thing the 3.0 has going for it is Nistune. But with all that work will net maybe 250-ish whp. Normal 3.5 DE swapped guys will actually be faster. But the 3.0 at this point is not going to set any records nor is it going to beat anything new really. The rate at which new cars make power these days. Just test pipes can pop the 370Z/G37 over 300whp. JUST test pipes. The 3.0 is a motor you boost if SOMEBODY was not hoarding all the S/C kits. Last edited by Crusher103; 11-03-2017 at 05:27 PM. Secondly even though the heads flow more in all honesty i do not see that making a big enough difference to bump up power with out the compression changing. Which it does in the +09 max motor, not in the +07 alti. 0.3 is pretty negligible. Maybe at 0.5 you'll see lower single digit hp. The real benefit outside of the headflow is the stronger bottom end the HR motors provide. This is a FWD HR we're talking about.. RWD yes, FWD not much or any upgrade over a older DE. (Darren just threw a cammed DE on the dyno made 300whp w/ stock compression). Where's the dyno of those cams with the HR head? Keep apples with apples. Normal 3.5 DE swapped guys will actually be faster. I went about as close as it comes to Old DE head/cam vs FWD HR head/cam by running both in the same car and have actual numbers that show otherwise. Unless someone wants to compare setups that are actually DE vs HR with the same mods, this thread is going to continue to be filled with speculation and hot air. Flow = hp guys.. This isn't rocket science. Yes i know the FWD version of the motor. They are nearly identical FWD and RWD. And engines are air pumps the more air you can pump in and out the more power you will make but seriously does the DE head flow THAT bad? That is the question you really have to ask. How much of an improvement is it going to be. I'm all for squeezing as much power out of something that you can but when it comes down to numbers how much more power? Take your own car for example was it because the HR engine was that much stronger because of heads and advancements in flow or was it because the rings and such were that much fresher and sealed better? 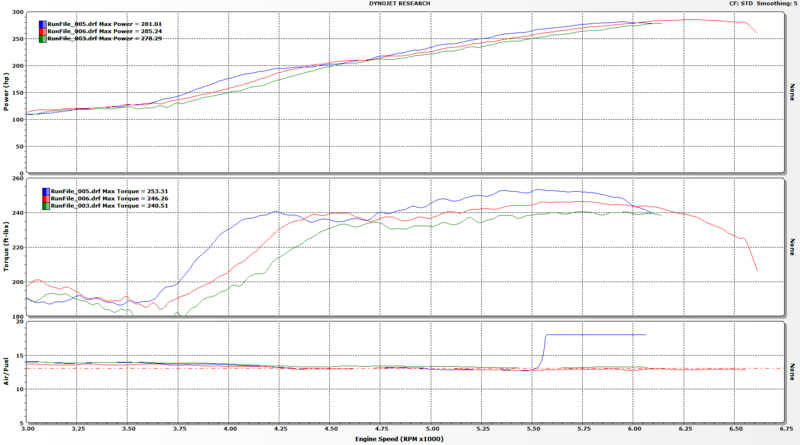 My 6spd G37 bone stock on that same dyno a couple of days later made 275whp and 237wtq. So before you scream high reading dyno, its pretty accurate. damn this is pretty discouraging seeing that i was hoping at least to be able to build a 3.0 timing high revving fwd hr that could run with most fwd vqs 07 and under. i thought the static timing wouldnt be too much of a deficit if i could compensate with a good tune on nistune and supporting mods.seems more and more like my only 3 options at this point are full 3.5 swap, cammed FI 3.5 3.0 timing. or a clean cammed dek FI. i wanted NA simply because this is my DD. ive looked all over the forums and just cant find anything conclusive enough to feel content. dont want to beat a dead horse but what will be the most logical of the 3. cammed FI dek for reliability, cammed 3.5 3.0 timing for decent reliability and slightly more room for improvement ? ( 3.5 on 3.0 timing is apparently retarded optimally for boost ) or full swap and go all the way (clearly the safest .. i dont like wires ). Last edited by 98max98; 11-03-2017 at 07:05 PM. RWD HR's main caps are worked into the block resulting in a stiffer bottom end. FWD didn't see this. Is the DE head that bad? Hell no. Is the HR head with more flow and a better cam out of the box better? Uh.. Yes. I was seeing a respectable trap and 31 MPG highway on the old motor so it couldn't have been that bad compression wise. It was also much much easier to bounce the limiter after the HR swap. Compression isn't going to change when the torque falls off but head flow will. The 3" exhaust went on before the HR swap and it was still night and day. I also agree with keeping VIAS, but here's the thing.. what kind of switchover is it? 00vi like [email protected]+ rpm, or more of a OFF-ON-OFF window switch? sounds like the setup you're running is the same setup i'm building. well if your car is a DD, you should do the best of both worlds..
get a 3.5DE and do a mild build: a revup oil pump, revup cams, eagle rods, juke head studs, HR headgaskets with dek cooling mod, will get you ~250whp n/a. with a supercharger and 10-12 PSI you will get close to 400hp..
you have the ability to remove the SC belt, change piping, change tuning map and run the car N/A Monday-Friday and still have more torque.. loop in the SC belt, change map, put on piping and you have your weekend fun car or as you need it. or you can always keep the 3.0 deK, do the rev up oil pump, rev up cams, juke headstuds. upgrade to 6spd transmission to keep powerband better with the gearing. yeah if i go sc im most likely going to keep the dek seeing that i already have one here. that was my plans originally just with out the FI . so i guess ill take it step by step with this dek i dont see the purpose in buying 3.5 at this point if 3.0 timing will take away most of the improvement and the reason for doing the swap anyway ,and i would still have to rip apart the block too build for boost. i do wish i could pull a little more out of the dek NA without going FI but noone can argue with a FI dek. that can probably run all day and if it break.. 250 too 350 for another one. cant beat the price. 6 speed swap is definitely in the list as well. i feel pretty confident with this any thoughts ? Last edited by 98max98; 11-04-2017 at 05:42 AM. On a 3.0 timing because we do not have VTC and cannot change our cam timing, we lose out. Most of the cam adapters we have are designed to make the car driveable not for all out power. The VTC allows the powerband to be shifted. So the 3.5 timing guys can almost fully utilize their cams to make as much power as possible and utilize that extra headflow. We 3.0 timing guys cannot do that. That's why consistently 5.5gens on up with the same mods make 20-30 more hp then 4/5th gens running 3.5s. And now with haltech and uprev starting to support the later model maximas. That's how Darren is now starting to see numbers such as 320whp. Im not trying to poo poo on the motor but the ability to tune is everything. I have a alti 3.5 that is boosted, untuned it could barely pull away from a 310whp E46 M3. Long winded opinionated response that doesn't prove me wrong. Cliffs: I went DE to HR hybrid. It was better. I tracked it and proved it. Dyno your car then. Because your numbers are on par with healthy DE 3.5 swaps. 13.3 it was at 106mph? Nealoc on a similar setup as yours with a DE ran a 12.9 at 104mph. I'm sure if i start digging and will find a few more DEs posting those kinds of numbers. especially from that DCmax area. Again, I'm not trying to say the motor does not have more potential but from what i have seen DE vs the HR. The altima versions are barely able to put down more than the normal DE. I had a 102.65 trap on my DE. It couldn't have been too unhealthy. You are right about the dyno. I should have dynoed my car. If I knew it was going to turn into a smoke show I wouldn't have put a new clutch in earlier this year. But I have no intention of dynoing an oil injected VQ. If you search, I'm sure you'll find some stellar performer DEs but like the numbers above show, my Alti swap still shows gains over most DEs. The difference between a 3.0 and a 3.5? No, but obvious gains. For what it's worth here is my best dyno to date. Engine is from a 07 Altima HR with 3.0 timing. I think it has more in it with a larger (3.5") intake and further tuning. Last edited by tkriggs; 11-06-2017 at 10:28 AM. That is a wonderful dyno indication of power under the curve. I see an improvement to be had by switching to a bigger 09+ maxima upper manifold (more volume, better flow with those s1 cams) and getting a better tune than JWT 'one tune kinda fits all real safe out the box'. Even with emanage you can bump up the midrange timing and get the fuel dialed in right. what is your manifold setup? block off plates for the VIAS or switchovetr at 5000? overall.. horsepower goes up directly to redline, flat torque curve from 4K+... this is everything you would want from a n/a maxima. I haven't seen any 5.5 HR dynos with a flat torque line like that.. I recall a thread where the two were compared..
and I also recall this from Harold's thread: post #1660 on head flow and what Ben @ JWT had said. "I had a long chat with JWT this afternoon, exploring some cam options, and of course I learned a bunch about VQ35DEs and cams and some other stuff. I hooked up with one of their race car builders, and after I kinda explained with I had and what I wanted to do, he skipped my suggestion of C8 cams and recommended the C11 intake and RZ1 exhaust cams for me. For a small fee JWT will do the machine work to clear the lobes in the heads. That's some big cams... OK..
Then he discussed the failings of the Cosworth heads (weird dual springs, heavy valves and retainers) and after some discussions of HR DLC lifters and HR head gaskets (I use both) we discussed how to use the superior HR heads (including the 2009-2015 Maximas) on my block and with the VQ30 timing chains. I'm going to locate a HR head and mount it on my other 3.5 short block (maybe both heads) and see what's up with this idea. On the JWT flow bench, the HR heads flowed better than any other Nissan or Cosworth head, so with a 4.0L short block, HR heads, and a super set of JWT cams and my existing HR intake parts and headers, I may not need nitrous !!" Crusher103 unless you don't trust the opinion of JWT... I think there's a good point on HR head flow.. you wanted proof, here's some quantitative data, and opinion of a very reputable shop that builds there motors and designs custom in-house VQ3x parts nobody else makes. don't get me wrong... making power is MAKING POWER... I've followed behind two high hp 4th gens running it... a 400hp turbo vq30 00vi pftb revup cam 5spd, and a 400hp turbo vq35(3.0 timing) pftb revup cam 5spd..
40 mph roll and both cars stayed just about even till 110mph with the 3.5 starting to slowly pull ahead.. a properly build and tuned max will put down the power and keep up with the rest of them in the top end..
but if the race was from a dig.. the 3.5 would've been ahead because more low end torque. never seen a race between a 400hp 35HR (3.0 timed) vs 400hp 35DE (3.0 timed) so I can't comment on that. a bigger 09+ maxima upper manifold (more volume, better flow with those s1 cams) - I've actually tried a 2017 Maxima UIM. No SSIM, No switching. Dyno below. I have a 2011 Maxima UIM and plan on testing it soon. There are subtle but definite differences between the two (Maxima UIMs). I'm going to test block off plates at some point. what is your manifold setup? block off plates for the VIAS or switchovetr at 5000? - 2007 Altima UIM, No block of plates, no switching. The ECU has the ability to switch the VIAS over at 3800 RPM, I've never hooked it up. For my application I'm rarely below 3,500 rpm so it's not a huge deal for me. I did test the UIM with the butterflies closed (see dyno below). There are gains in the lower end BUT what I didn't realize at the time is that the flex pipe on the Cattman was shredding itself on the inside (going from a 2.5" circular to 1"x 1/2" rectangular opening) thus affecting all my dyno runs that session (about a month ago). I plan on re-testing to see what kind of gains there are down low. 07 Altima UIM (run 5)vs. 17 Maxima UIM (run 3) (no switching on either). Looks like power may have kept going up with the 17 UIM had we carried out further. Run 8 is a closed VIAS on 07 Altima UIM with a very bad flex section. Last edited by tkriggs; 11-09-2017 at 01:08 PM. I would be very curious to see what a 3.5" maf/intake and the '11 UIM would do winded out farther. I was curious as well. I asked Darren what he would do and he recommended a 3.5" intake with a 5th Gen MAF and extending the air filter/intake pipe up to the screen where my fog light used to be (the air filter is in front of the wheel well on the left front but not up to the screen that replaced the fog light). I have the TB from the 2011 Max as well so I'm really curious to see if I can convert it to cable, use the 2011 UIM (test block off plates) and redo the intake track to 3.5" w/the 5th gen MAF. Apologies to 98Max for hijacking your thread! efficiency is increased together with the effect of the long intake passage. charging efficiency is obtained for the various driving conditions. Thanks Leonard (appreciate the input you provided). Here is a '07 Altima Intake vs. a '11 Maxima Intake vs. a '17 Maxima Intake. Maybe the 3" intake is hurting the Maxima intakes? Not surprised the graphs shifted to the right...just a little surprised by the amount of drop in torque (maybe I shouldn't be). Last edited by tkriggs; 11-22-2017 at 10:54 AM. As far as the race is concerned. Power under the curve. That 3.5 is going to make more torque, and have a broader and flatter curve. I would expect a HR motor too likely beat a DE given all things are equal for the same reason. so i am not disputing it will be a little faster. This actually reminds me of a conversation i had some time back with another orger about putting HR valve springs and a rev-up oil pump on a 3.0 that was not going to rev past 7000rpm, and the car was turbocharged, it was like if you want to make more power on turbos add more boost not more revs lol.